Newcomer Family Obituaries - William Mills 1943 - 2019 - Newcomer Cremations, Funerals & Receptions. William Mills, 75, passed away on April 7, 2019. He was born on June 15, 1943. He was a veteran serving in the U.S. Army with the 101st Airborne Division. William worked for the Columbus City School Board. He was preceded in death by his parents, John and Cleo Mills. Surviving family includes wife of 53 years, Cheryl, son, Todd (Shanna) Mills, grandchildren, Hailey Arms, Morgan Perkins, brothers, Charlie Hill, Jim Mills. 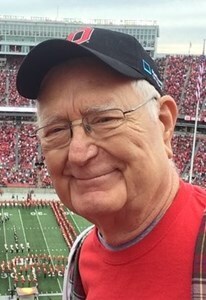 Visitation will be held from 10am to 12pm, Saturday, April 13, 2019 at Newcomer, SW Chapel, 3393 Broadway, Grove City, OH, where a funeral service will begin at 12pm. Add your memories to the guest book of William Mills. I will never forget the Christmas that you wrapped up all of the hotel toiletries, and dentist samples as a gift for Todd! I thought I was going to lose my mind because you know how I hate clutter. You laughed and laughed and said that the gag gift was really a joke on me because you knew I would get all flustered to see so many little bottles of shampoo, soap, toothpaste and floss! I will never forget our father and daughter in law date to see your favorite hockey team play. Just the two of us! I will forever remember the day I first met you with Todd at the Jackets game and you told Todd how pretty I was. It made me blush and made me nervous but there was a sweetness behind it. I will never forget tryin to teach you and Cheryl how to use new technology, iphones, and computers and how funny it was to try FaceTime with you! Above all I will never forget that you raised my husband. You have taught Todd to be a wonderful man and husband, a courageous fireman, a provider, a strong thoughtful son, and one heck of father figure to Hailey and Morgan. For this I am thankful! You are one of the few great men I have ever come to learn and know in my life. Cheryl was extremely lucky to have for so many wonderful years... selflessly placing her above yourself at all costs. You truly loved her like I have seen no other man love a woman! I am blessed to have witnessed your love, kindness, and for you to have welcomed my family to your family! Carry on your work from above in peace with rest!